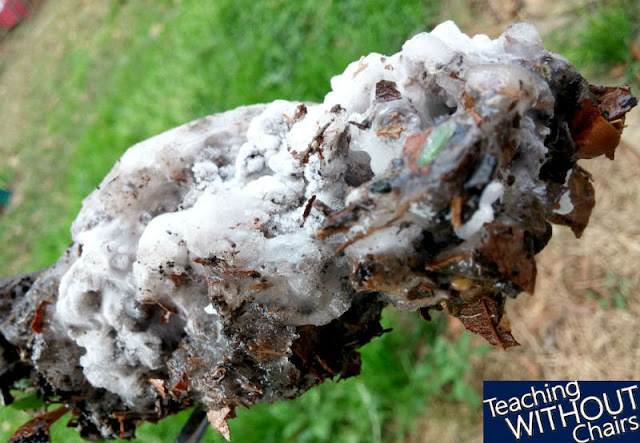 This comet science experiment is all about building a model, and it is part of our Homeschool Space Science Unit Study! I'll be sharing more hands-on science activities from our homeschool's Space Unit Study in the next few weeks! Today, we're starting with comets! Real comets are made from rocks, dust, frozen water, frozen gasses (like carbon dioxide), and organic matter (usually things like amino acids and nucleic acids). Ask your kids what you could use to represent all these components! What are comets made of? - What we used in our model! SAFETY NOTE: Remember never to touch dry ice with your bare hands! We used tongs, a hammer, and big spoons. 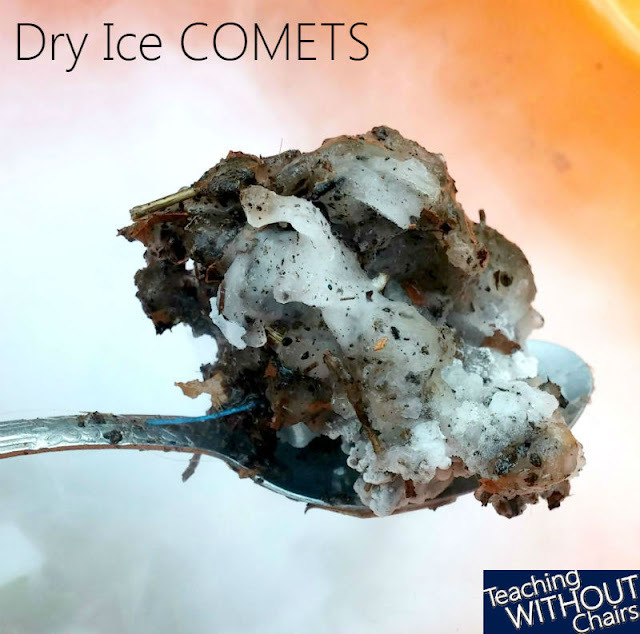 I love that real comets have "dry ice" in them, and that that was the glue in our comet models! It kinda felt like we were touching space as we worked with it! Here's what we did, though you can make your own model however you want! 1- Crush the dry ice (frozen carbon dioxide) and put it in a cool orange bowl. 2- Mix together all the ingredients EXCEPT water and vinegar. 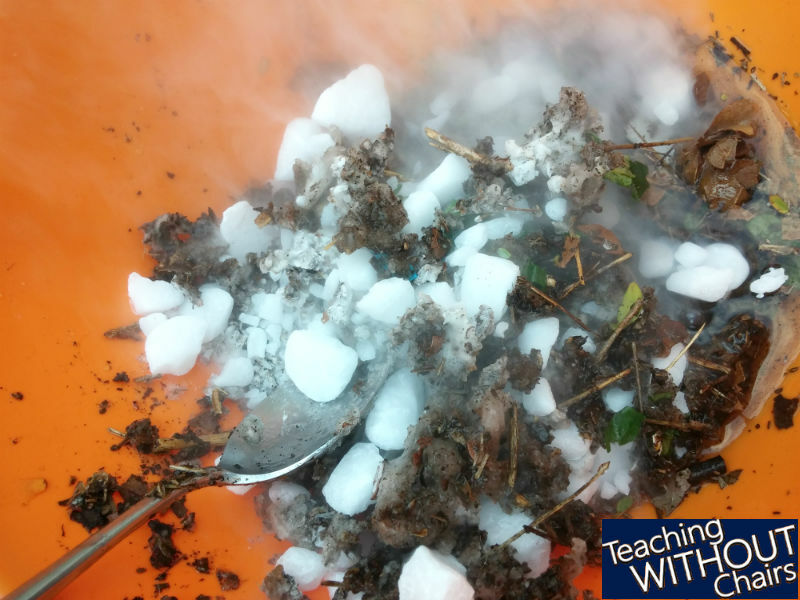 I actually encouraged the kids to add those last because the dry ice would freeze them and that would glue everything together. 3- Add the water and vinegar in a slow drizzle and use spoons to squish the comet ball together. Small bits of water and vinegar froze quickly, but it took about five minutes of cooling and pressing for our "big" comet to be ready. 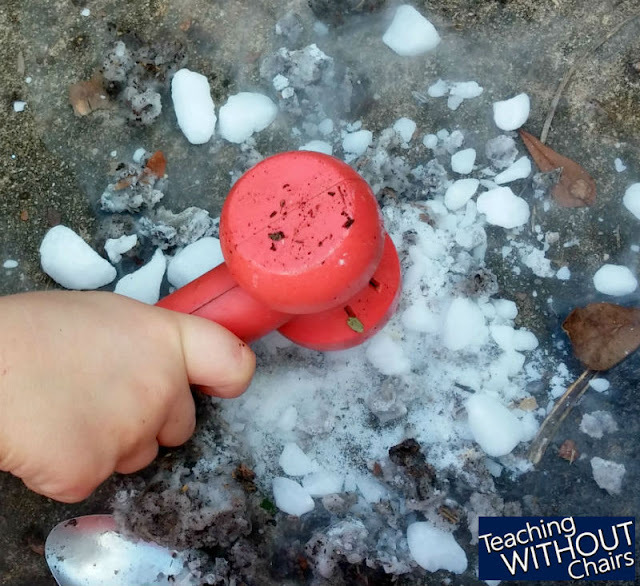 4- Carry it around the yard on a spoon to simulate the comet orbiting the sun! This is a perfect time to bring up that all models have limits and benefits. For example,we can't make a "dirty snowball" (as comets are sometimes nick-named) that will orbit on its own. But, we can watch one way that the right ingredients and forces can harden into an icy ball...like a comet! Why do comets have a tail? When the icy comet gets close to the sun, solar radiation and solar winds knock off, blow, and melt enough ice and dust that it looks like a tail falling off the comet. Most of the tail is water vapor. A comet has three basic parts: the nucleus, coma, and tail. The nucleus is the compact center of the comet. When it gets close to the sun, water vapor and dust make rise off the comet making a sort of atmosphere called a coma. As the coma gets hit with solar winds and radiation from the sun, water vapor and dust blow behind the comet, forming a tail. Most comets come from either the Kuiper Belt or the Oort Cloud. The Kuiper Belt begins after Neptune and is full of icy rocks (including dwarf planets like Pluto). The Oort Cloud is beyond the Kuiper Belt and is expected to be full of cometary nucleuses orbiting at the farthest reach of our solar system. Generally, we expect comets that take more than 200 years to orbit to come from the Oort Cloud. Yes! Comets have been seen for thousands of years and were historically named after the year they were seen (like the Great Comet of 1680) or people (like Ceasar's Comet or Halley's Comet). Comet Swift-Tuttle was named after two separate astronomers who discovered it on their own a few days apart. Comets are still named after people, but the International Astronomical Union also has a numbering system that they use to label all comets too. Most comets have a nucleus 1-2 miles across! Some are much bigger though! What's the longest we've seen a comet? In 1995 Comet Hale-Bopp was visible from Earth to the "naked eye" for 19 months! How are comets and meteor showers related? Every 76 years Halley's Comet passes through our solar system, leaving a trail of rocks, ice, and dust behind. Every year Earth's orbit passes through that debris (usually in October). Pieces of the debris burn up in our atmosphere, making lots of "shooting stars" that we call the Orionids meteor shower! Have we ever landed on a comet? Yep! In 2014 the spaceship Rosetta's lander Philae actually landed on Comet 67P! In 2016 Rosetta itself also crash-landed on the comet, ending a historic 12-year mission! Learn more here. In the end, we left our comet model on an outdoor table. 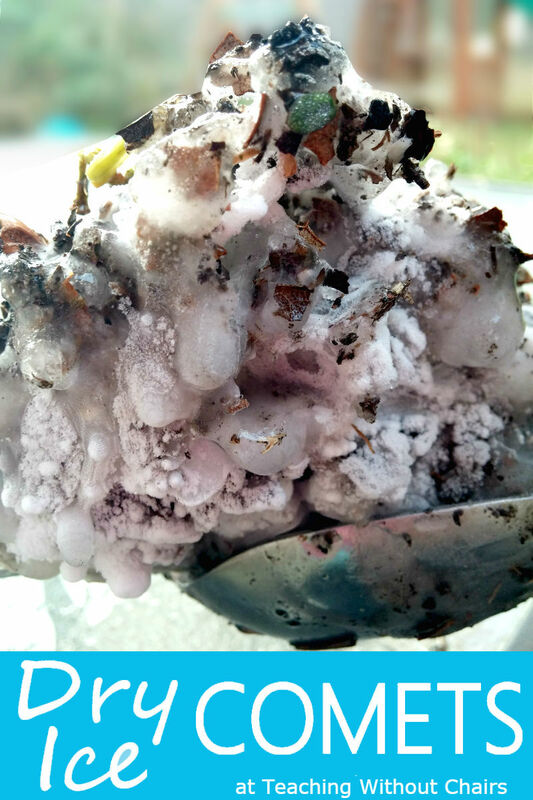 The next day it had melted into a small pile of rock, dirt, and organic matter, which was all recycled back into our garden. I hope you have a great time studying comets and experimenting your way through space! Be sure to join us for more fun space science experiments in the Space Science Unit Study!